It is with great sadness that we record the deaths of two valued members of our club who have died in the past week. He became President of the club from 1977-1978 and was elected as a Paul Harris Fellow in 1997, to be followed by a Paul Harris Sapphire award in 2011. Always ready to do anything to support the club and the community, his was a cheery countenance that will be remembered by a huge number of people and our deepest sympathy is extended to his wife, Ann, and to his family. A service in celebration of his life will be held at Oakley Wood Crematorium, South Chapel, at 11.30 am on Monday 25th March. 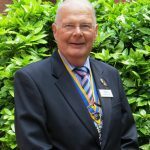 John Taylor joined Warwick Rotary in 2012, having previously been a member at the Chorley Astley Rotary Club in Lancashire since the mid 1980’s. A retired police officer, he was a most enthusiastic and very ‘hands-on’ member who led by example, and brought out the best in other people. 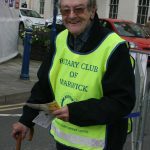 He was a Trustee, and later Secretary, of the Rotary National Shoebox Scheme and on joining the Warwick club headed up many initiatives. From 2016-2017 he was a very popular and active club President, despite the onset of serious health problems. He had been elected as a Paul Harris Fellow by his previous colleagues in Lancashire in 2001, and in 2018 his fellow members at Warwick gave him a Paul Harris Sapphire Award. His final months were plagued with bad health, which he bore with typical strength and good humour, and he will be remembered for all the good works he did for others. His wife Joan, and his extended family, who he cared for deeply, are very much in our thoughts. The funeral will be held at Oakley Wood Crematorium (South Chapel) at 12.30 pm on Tuesday, 9th April 2019.